Conducting an efficient co-channel interference identification survey at the tower site, culminating in phased-array design. 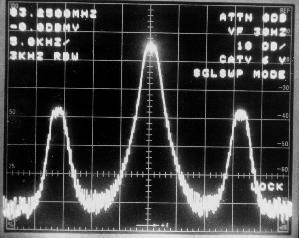 Reception of Ch 6, Philadelphia, absolutely free of co-channel interference. Assembled and tested high-band phased-array before lifting by the tower crew. Ch 3, Philadelphia, suffered from heavy co-channel. Observe the -18dB beat two divisions left from the the Ch 3 video carrier.